Know someone graduating from college/vocational/trade school or a Thurston County area high school in spring of 2019? If this student has a GPA of at least 3.0, he/she may be eligible to apply for our annual scholarship grant opportunity! FACSPS is giving $1,000 to each one of six hardworking students who plan to pursue their education after high school graduation. Please carefully read details and instructions on our forms available for download below. If you have any trouble obtaining these forms, please let us know on our contact page. Please email our Scholarship Coordinator Chito Balangue if you have any questions. Applications will be due April 30, 2019. It is VERY IMPORTANT to submit all required documents by the due date; applications postmarked after the due date will not be accepted. The Scholarship Awards Ceremony take place during our annual summer picnic at Rainier Vista Park on August 10, 2019. ​THE DEADLINE FOR THIS YEAR'S SCHOLARSHIP APPLICATIONS ARE DUE APRIL 30, 2019​. The FACSPS 2019 Scholarship Application form is now available for download. Students may either hand write legibly or type directly on the form and print out a paper version. The printed copy, along with the other requirements indicated, must be mailed to the address stated on the application (and below). Applications must be postmarked no later than April 30, 2019. Please email or call our Scholarship Coordinator, Chito Balangue if you have any questions regarding our application process or program. This year, we will start honoring our college graduates with an award of recognition. You must be of Filipino heritage in order to receive the award. A ceremony will take place during our Annual Picnic at Ranier Vista Park on August 13th. Please fill out the form below and mail to our P.O. Box address. Every year, FACSPS awards open-competitive college-bound grants, certificates and cash to commend the scholars of that year's graduating class. The awards are given to college-bound Thurston High School graduates and do not have to be of Filipino descent to apply. In past years, the Community has also held a spelling bee, or Tagisan ng Talino competition, later in the fall while celebrating the scholastic and athletic achievements of its youth members. It’s an afternoon of jolly contest in spelling for Grades 2-6, general knowledge and Filipino culture quiz competition for grades 6-7, and essay-writing contest for students in high school. The competition can be intense and mind-bending at times. One observes a bunch of nervous and tense moms and dads in the audience watching their kids compete on stage. FACSPS not only honors those who academically succeed but only those who show promise in the arts and prowess in athletics. An art exhibition featuring the artworks decks the venue lobby. The winners in the essay-writing contests are announced, whereupon the winning essay is read. A past winner of this essay writing contest was Vanessa Cendana who wrote a provocative, scholarly piece on the topic, “The Filipino-American Student and the Call to Academic Excellence." Why is the scholastic and athletic achievement celebration so special to the Community? It is because FACSPS wants to emphasize to our youth in their early formative age the value of academics and athletics. It is through the development of the intellect and healthy body that one can give fruition to an individual’s ambition. We want to establish a norm whereby the pursuit of knowledge and formal education can be as fun as a game of basketball, as soothing as a Beethoven sonata, or as refreshing as a painting of Monet. FACSPS wants to strengthen the notion that for a Filipino-American student, college education is the next logical step after high school. That education per se is a never-ending search for what is true, noble and beautiful. With an appreciation for academics and competitive spirit, we impart to the youth, albeit slowly, a tradition of excellence, of leadership, and of concerned citizenship in our new country. And that indeed, America is a great country where opportunities arise especially for those who are willing to prepare themselves academically, and to compete fair and square in the various arenas of human endeavor. 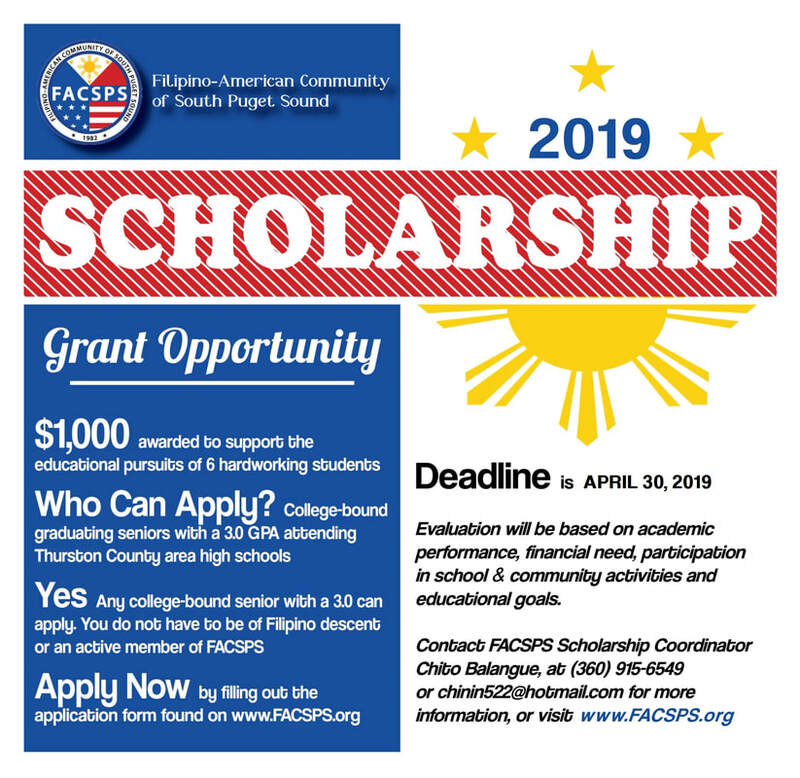 Updated 2019 Filipino-American Community of South Puget Sound is a tax-exempt agency and non-profit, I.R.S. Code 501 (c) (3). Federal Tax ID No. 91-1534437. Donations are tax-deductible to the full extent allowed by law.